Whether you’re new to healthy eating or you’ve been eating clean for awhile, you’ll love this gluten-free and dairy-free Clean Eating Food List with 25 Pantry Favorites. I believe having an organized, well-stocked kitchen is one of the keys to success on a clean eating diet. Would you agree? I’m a fairly organized person by nature, but my pantry tends to get a little messy and cluttered. 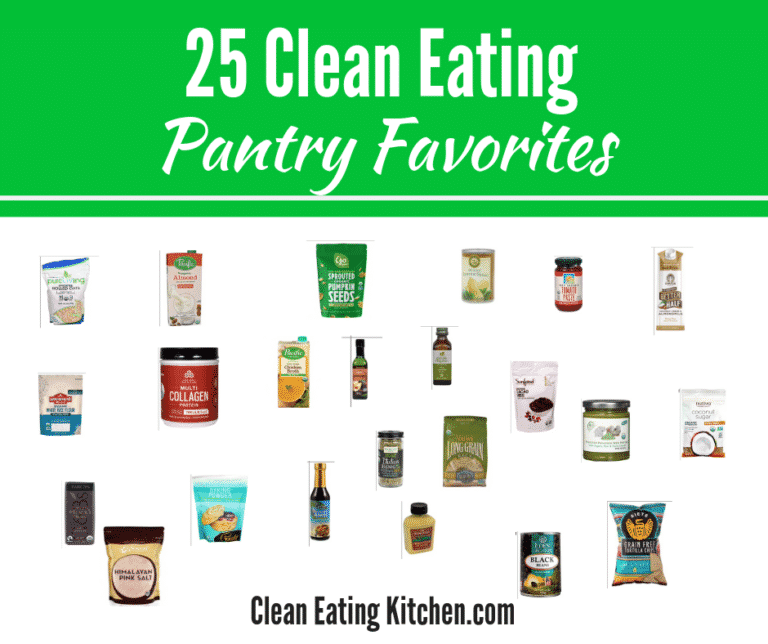 As part of my spring cleaning efforts, I recently re-organized my pantry, kept only the necessities, and created a clean eating food list with 25 pantry favorites to share with you today. Note: this post is sponsored by Vitacost.com, one of my very favorite online retailers. As part of this post to celebrate Vitacost’s 25th birthday, I’m offering a $100 gift card to one lucky reader! See the entry link at the bottom of this post. 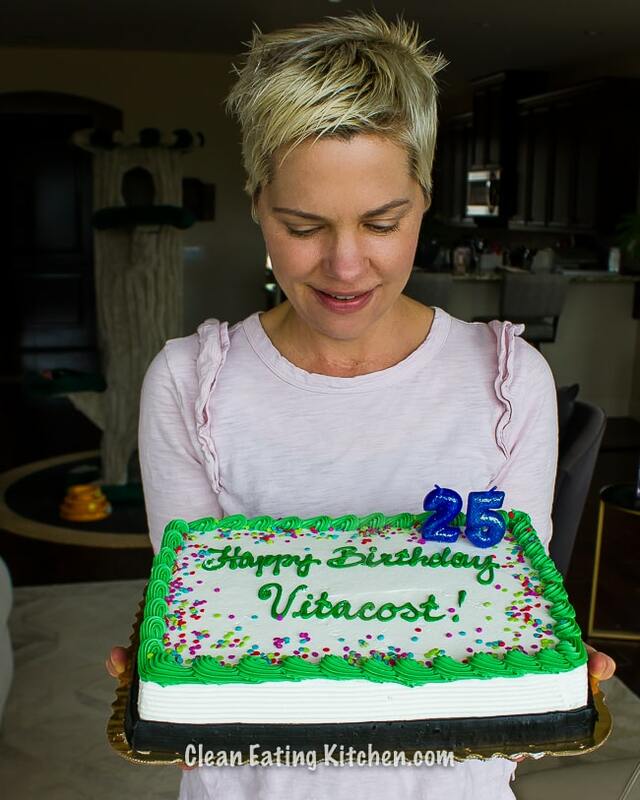 Vitacost is celebrating its 25th year in business this month. What an accomplishment! I am so proud and honored to be part of the Vitacost influencer team, especially since I’m also a loyal customer. 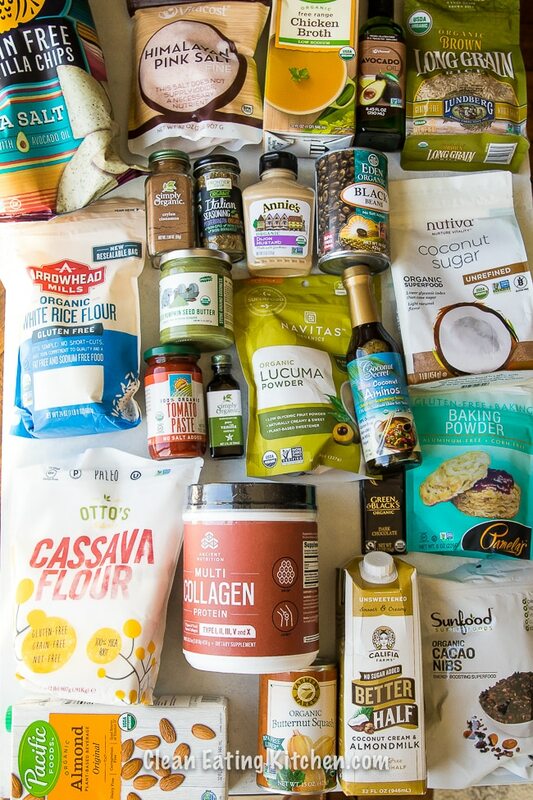 I order from Vitacost on a weekly (sometimes bi-weekly) basis, and I adore their selection of organic, natural, and holistic foods, beauty products, and supplements. Vitacost has got you covered from head to toe! All of the items on my clean eating pantry list are available at Vitacost, and I’ve linked to each one of them below. Here’s a basic clean eating food list that meets the standards of most healthy diets. 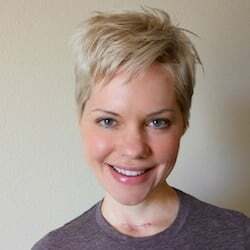 I follow and promote a gluten-free and dairy-free approach to minimize inflammation, so all of the items I’ve included are both gluten-free and dairy-free. I find that when my fridge and pantry are well stocked, it’s much easier to plan and prep meals and always have something healthy available. I don’t eat out that much which saves me money and helps me stay on track with my health goals. While I believe that everyone is different and diet isn’t a one-size-fits-all situation, this clean eating food list is a great place to start. If you want more guidance on how to fill a clean eating plate, then you can get my Clean Eating Meal & Snack Guide here. Also, if you’re confused about the differences between clean eating, paleo, keto, Whole30, and vegan diets, then check out my article that explains it all. Cooking oils and other healthy fats: avocado, coconut, lard, ghee (not appropriate for dairy allergies), etc. Whole grains (gluten-free): buckwheat, oats, rice, millet, corn, etc. 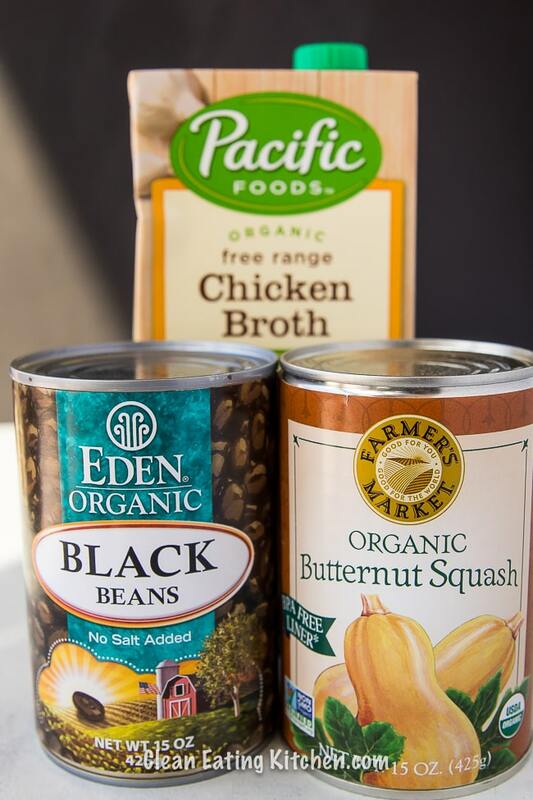 To help make a clean eating lifestyle easier, I like to stock my pantry with these gluten-free and dairy-free pantry favorites. I’ve organized my 25 clean eating favorites into categories and linked to all of them below. I hope you find some new items to help stock your healthy pantry and support your clean eating diet. I always have a small bowl of sea salt by my stove and cook space. Adding sea salt to recipes is a healthy way to bring out the flavors of the dish. Italian seasoning is my 2nd favorite way to add flavor to my savory recipes. I love this particular brand because it’s organic and non-irradiated. I always have it on hand. For a soy-free and gluten-free seasoning that takes the place of soy sauce, I always recommend using coconut aminos. It’s extremely versatile and can be used as the base of teriyaki sauce or any kind of savory sauce. It’s also a great condiment to add extra flavor to savory dishes without being overly salty. If you’re still using canola or vegetable oils in your kitchen, then it’s time to upgrade to a safer cooking oil. Avocado oil is perfect for cooking because it’s safe at high temperatures. It has a neutral flavor. I use it anytime I’m cooking and need to sauté. This is my favorite broth to have in my pantry. I use a lot more broth now that I cooks much in my Instant Pot pressure cooker. I like using broth instead of water to cook since it adds a lot more flavor and nutrition. I adore the Eden Foods brand, and I love the prices at Vitacost. This is the brand of black beans I use in my black bean brownie recipe. Vitacost also sells the dark chocolate chips I like too! Using canned pureed butternut squash and pumpkin in my baking is a little clean eating secret of mine. I sneak it into almost all of my baked goods to help reduce the amount of oil I need without sacrificing moisture. I also add it to stews and smoothies. You can’t taste it, but pureed squashes are full of healthy beta-carotene. See my Vegan Pumpkin Ice Cream recipe here. Adding tomato paste to stews and savory dishes is another way to add healthy nutrition and flavor. This is my favorite brand because it comes in glass and can be stored in the fridge if you just want to use a tablespoon or two at a time. This is hands-down my favorite brand of rice. I’ve recently started making rice in the pressure cooker and made it part of my weekly meal prep. Brown rice bowls with roasted veggies and a protein like roast chicken is one of my favorite lunches. Dijon mustard is great for making oil and vinegar vinaigrettes, or for just adding flavor to almost any dish. Coconut sugar is my favorite sweetener for baking. It’s lower glycemic than other options, and tastes great. I use it in my Black Bean Brownies, Air-Fryer Blueberry Muffins, and almost all of my baked goodies. This is the brand of almond milk I keep in my pantry for use in baking or enjoying with granola. Adding vanilla extract to baked goods is a great way to add complexity and depth to the flavor. This is the brand I use most often. This is the brand of oats I’ve been using lately for oatmeal or for adding to baked goods to add fiber and nutrition. Every baker needs baking powder and this is the certified gluten-free brand I use and trust. Did you know there is real cinnamon and fake cinnamon? This is the real stuff and I add it all my baked goods, smoothies, and desserts. Vitacost has tons of gluten-free flours available, and this is one of my favorites. I also love cassava flour and anything from Bob’s Red Mill. I make all my green smoothies taste like a chocolate milkshake using cacao nibs or cocoa powder. This is my favorite version of cacao nibs. I’ve been using lucuma powder for many years now to add a very mild sweetness to my smoothies. It’s a superfood and helps mask that veggie flavor in my Choco-Green Breakfast Smoothie. I’m a huge collagen protein fan and love that it’s another ingredient I can find at Vitacost. This is a great brand. Read more about collagen protein in this article. Adding a healthy fat source to smoothies is a must, and I love using this sprouted pumpkin seed butter for that purpose. It has a delicious flavor and is super nutritious. This is the brand of dairy-free creamer that I use and recommend. I love the Go Raw brand of sprouted nuts and seeds. Pumpkin seeds are perfect for adding onto salads for crunch and flavor. These are the best tortilla chips you’ll ever have. They’re made from cassava flour so they’re grain-free. So yum! I’m a chocoholic and this is one of my top 3 favorite brands of chocolate bars. It’s so creamy, yet it’s dairy-free. $100 Vitacost.com Gift Card Giveaway! I’m excited to try the canned butternut squash! The Green & Black’s Organic Dark Chocolate! I didn’t know they had so many great products! The sprouted pumpkin seeds are my favorite. I’m excited to discover Farmer’s Market Organic Butternut Squash here! I love butternut squash, and would like to try adding it to recipes to substitute for oil, and just for added goodness. I never knew you could get it in a can, esp organic. I often don’t buy a squash, even though I love it, it is kind of expensive. I’m very interestedin trying Coconut Secret The Original Coconut Aminos Soy-Free Seasoning Sauce. I’m gonna try this rice flower! I have been using almond flour only for years now for baking, but I’m feeling like everything tastes the same and it’s just gotten a bit too heavy for me. I’m wondering if I mix half rice flour and half almond flour, if that will lighten things up a bit? I think that’s a great idea, Jennifer! I agree, almond flour is so dense sometimes. Let me know how the blend works out! XO. Great post, Carrie! I love VitaCost and order from them frequently as well… I hadn’t heard of sprouted pumpkin seeds before! 😋Gotta give them a try. Thanks for entering my giveaway, Geoffrey! I’ve tried that brand of chocolate, it is delish!!! it’s nice to see that I actually have some of these items in my pantry! I’d like to try Windy City Organics Dastony Sprouted Pumpkin Seed Butter. I love pumpkin seeds, but I have never tried pumpkin butter! All of these products look amazing! One that I really want to try is the Pumpkin Seed Butter. Sounds good to me! I am definitely picking the Westbrae Natural Dijon Style Mustard! I love love love Vitacost!!! It helps me with anything I need a non toxic solution for. I’m most excited about the Madagascar vanilla extract! I would love to try lacuma powder. It sounds perfect for smoothies! I’d like to try the Avocado Oil. I saw a recipe just tonight that recommended it and I don’t have any! 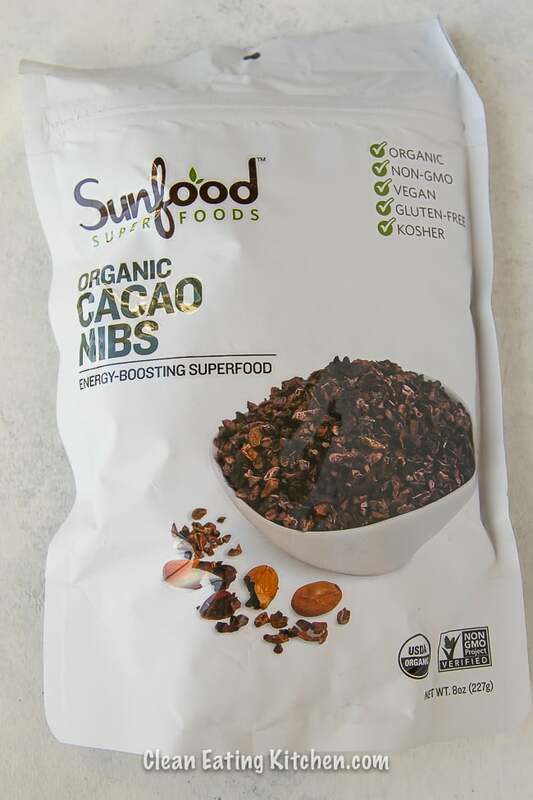 I usually go for Trader Joe’s unsweetened Cocoa Powder but would love to try Sunfood’s Organic Cacao Nibs. They look delicious! Great recommendations! The himalayan sea salt and the Ancient Nutrition Multi Collagen Protein are the two I would most like to try. I would love to try the Sunfood Raw Caco nibs on top of some raw brownies! I would love to make your ice cream with the Farmer’s Market Organic Butternut Squash! Great list! I am interested in the sprouted oats. I am excited about the Califia coffee creamer! I have to have creamer in my coffee and this looks healthier and tastier than what I currently use! I’ve never tried VitaCost but with this giveaway I hope to discover some really amazing clean eating foods. Thanks Carrie! Such a great post! SO many of my favorites are things you included! I think my #1 would be the Siete chips…they are life changing! I’ve never heard of Vitacost…will definitely be checking them out! I really like that farmer’s market butternut squash (and their pumpkin and sweet potatoes as well). I really like those beans too and have been meaning to try avocado oil. Love chocolate in all forms, and I’ve been behind the eight ball with trying cacao nibs! 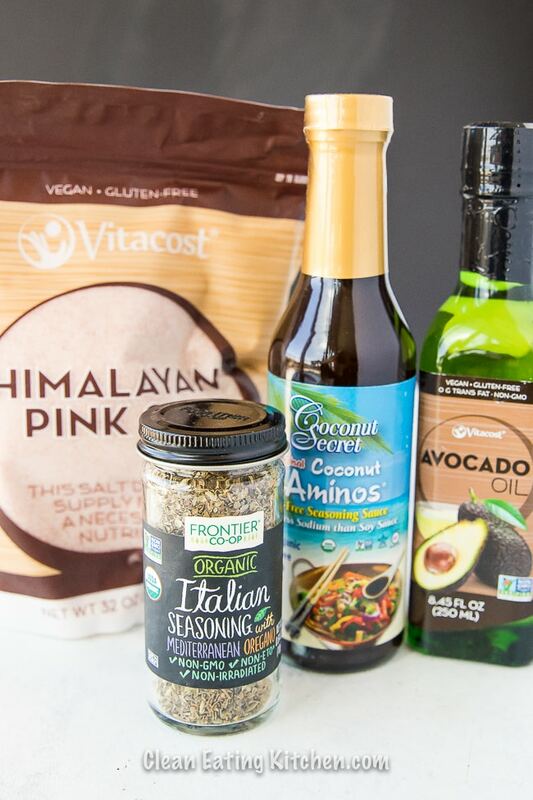 I’d be most excited to try the Vitacost Avocado Oil! 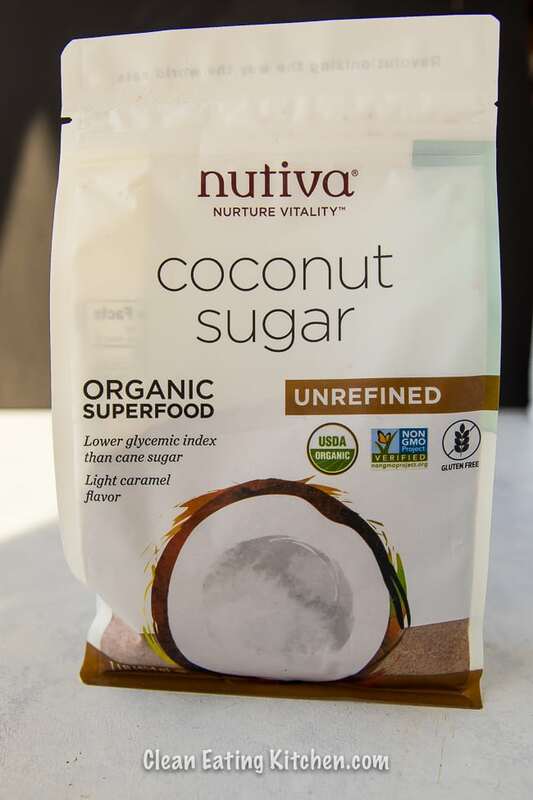 I’m also intrigued by the Navitas Organics lucuma powder & would love to try it! The coconut sugar looks really interesting. Great suggestions here! I love Sunfood Superfoods! And Green & Black’s chocolate. Haven’t tried lucuma powder – will definitely look into that! The sprouted pumpkin seed butter sounds intriguing! I love the seeds, I bet it has an amazing flavor to it. I’d love to stock up on pink sea salt and some new seasonings!! I’m most excited about the black beans! No one else in my home likes them. 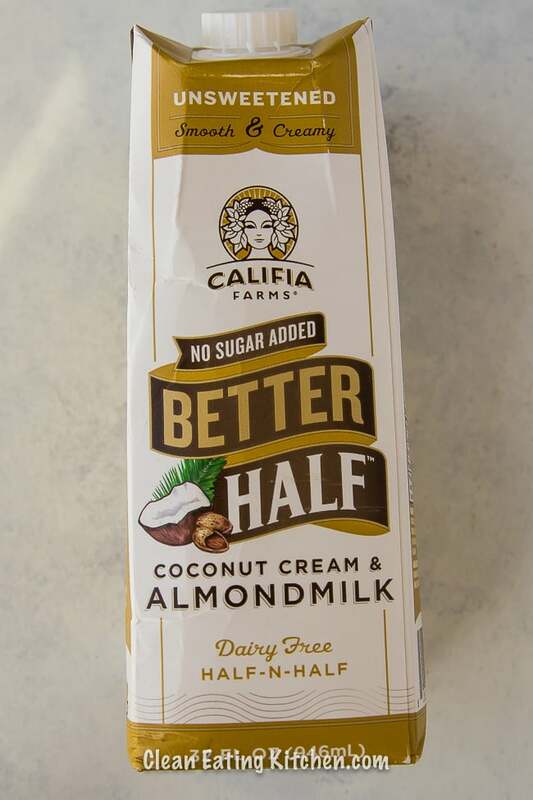 I would like to try the Califia Farms Dairy Free Better Half Coconut Cream & Almond Milk . I would love to try the Green & Black’s Organic Dark Chocolate 70% to satisfy my sweet tooth. I am most excited about the Siete Grain Free Tortilla Chips. I love making energy balls and I’d love to try the organic cacao nibs in them! Dying to try the collagen! I want to try the mustard! I’d love to try your Tortilla Chips!They look delish! I didn’t realize they had that creamer! I’ll grab some next time I stock up. I’m most excited to try the sprouted pumpkin seed butter (so green!) And the Siete Food Tortilla chips.